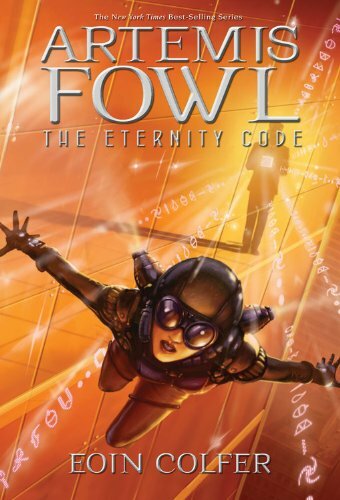 The Eternity Cube (Artemis Fowl, Book 3) by Eoin Colfer is the third book (and seemingly last) in the Artemis Fowl series. It is a well-written, fun filled fantasy for children. It continues the story of Artemis Fowl, now 13-year old, the boy genius who has one last adventure involving reclaiming a stolen computer with fairy technology from an unscrupulous American businessman with crime family ties. The Eternity Cube is set on an estate on the outskirts of Dublin, Ireland and in Chicago. At the beginning of Book III, Artemis has decided to make one last financial coup for the Artemis family by scamming an American businessman into giving him one metric ton of gold. The deal seemed flawless. Artemis and Butler are to meet Jon Spiro, the CEO of Fisson Chips in a popular restaurant. Artemis would demonstrate the C-Cube, a computer he built out of parts from fairy equipment that is light years ahead of human technology. In exchange for the gold, Artemis would keep the computer off the market for six-months. Artemis, however, has finally met his match in Jon Spiro. Spiro is not only cunning, but he is completely unscrupulous. He seizes the computer and leaves his bodyguard, Arno Blunt, to eliminate Artemis and company. In the melee, Butler is shot. Artemis must rely on Holly Short (a captain of the LEPrecon (Lower Elemental Police Reconnaissance) an elite force trained in dealing with the "Mud People" (humans) who appeared in Book I and Book II.) and fairy magic to save Butler's life and retrieve the C-Cube. Needless to say the LEPrecon are none to happy with Artemis failed plan, however, to remove the threat of yet another human (or "Mud Person") from discovering about the "People", Holly, Julius, and Foaly agree to help Artemis retrieve the C-Cube. The price of the healing and retrieval is steep - Artemis and his companion must have their minds erased of all memories about the People. Meanwhile, Jon Spiro discovers that he and his scientists are unable to utilize the C-Cube due to an "eternity code" that Artemis has programmed into it. Thus Spiro contacts Carla Frazetti, daughter of Spatz Antonelli, head of the Antonelli family to use some of their muscle to go to Ireland, kidnap Artemis, and bring him to Chicago. She arranges for Loafers McGuire and Mo Digence, two not too bright gangsters to accomplish the task. What follows is a real comedy of errors. Look for the return of Julie, Butler's sister, and Mulch Diggums, the "kleptomaniac dwarf," in yet another disguise. I found The Eternity Cube the least likeable of the Artemis Fowl series. Fatal injury and the potential of death figured prominent in the previous books of the series, however, this time it seems so much more pervasive. By now even younger readers should have gotten used to this feature in the series. Still it proves to be unnerving every time it happens to one of the main characters. In Book III it seems just a bit over the edge. I think that it is important to beware that younger readers might find this unnerving especially in this Book. The Eternity Cube (Artemis Fowl, Book 2) by Eoin Colfer is the third book and probably last in the "Artemis Fowl series". It should be noted that the material about the death of Butler, a main character, could prove to be unsettling to some readers. Otherwise, the book was enjoyable, but I personally liked Book II better. The book is recommended for ages 10 years and up. I recommend this book.